If you live in an affluent neighborhood in the Research Triangle, Charlotte, or a handful of other metropolitan areas in North Carolina, chances are you’ve seen crews working roadsides over the last year installing fiber optic cable. Maybe you’ve already signed up to boost your internet connectivity and know what a revelation it can be to have a world of people, experience, and commerce at your fingertips. On the other hand, if you live in a community with little or no access to broadband, the story is quite different. Maybe you’ve sat in a library parking lot while your children do homework, or struggled to keep up with business competitors, or raged while a video of your grandchild’s first steps refused to load. 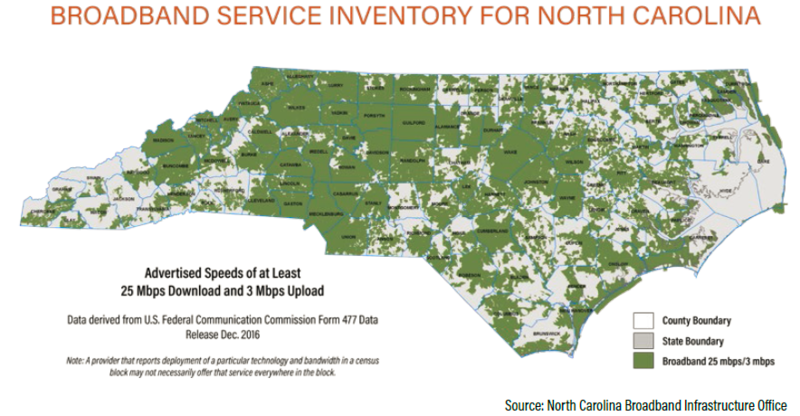 A new report from the North Carolina League of Municipalities documents the dire need to expand broadband access across the state, and lays out some of the steps we can take to make that happen. (For anyone interested in joining the conversation about broadband solutions in North Carolina, an upcoming event on April 20th at the NC Rural Center provides a great opportunity). The digital divide in North Carolina is a classic market failure. While private internet service providers rush to capture lucrative urban markets, they do not always invest in small towns and rural communities. This lack of investment isn’t a moral failing on the part of big telecom companies, they have a fiduciary obligation to shareholders to maximize return on investment and it is often more expensive to serve sparsely populated communities. Still, the result is that many North Carolina communities are falling farther and farther behind their urban neighbors. This is precisely the kind of situation that requires public investment and public-private partnerships to overcome the failure of the open market to deliver a necessary public good, as we have done with public education, roads, airports, parks, and other vital public needs that are often under-provided by the private market. Given the growing economic and social importance of reliable broadband, its time for state and local governments in North Carolina to develop solutions that make sure no community is left behind. Ongoing court challenges allow DACA recipients to renew their status, but the program is closed to new applications and the future of Dreamers and their families has been thrown into doubt. This the lack of resolution itself is traumatizing DACA recipients, many of whom are or have children. A new report, based on extensive interviews with educators, counselors, and health professionals, documents the many ways that President Trump’s decision is harming children and families across North Carolina. According to a 2015 survey, roughly one-quarter of DACA recipients have children who are U.S. citizens, and now those children are living with the constant fear of seeing their parents deported and their families torn apart. Regardless of whether President Trump understands the weight of his actions, he chose to dismantle a program that made children feel more secure and less afraid (a recent study found that children of mothers who were eligible for DACA were much less likely to be diagnosed with adjustment and anxiety disorders). Now, young children are being exposed to levels of stress and anxiety that can leave lifelong physical and emotional damage. If you’ve already thrown your neck out shaking your head at the cavalcade of divisive vitriol emanating from the Trump administration, it’s probably best to stop reading now. Multiple outlets are reporting that, during an Oval Office meeting on immigration, the President wondered aloud “why are we having all these people from shithole countries come here.” The disgusting remark was made in reference to people from Haiti, El Salvador, and several African nations that seek Temporary Protective Status (TPS) to work and reside in the United States because of natural disasters or other dangers in their home countries. 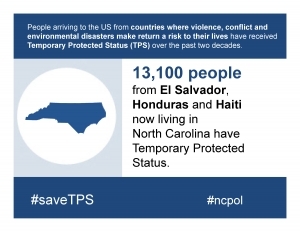 While you may have already heard about the President’s disrespectful comment, many people do not fully realize the importance of TPS to North Carolina. There are over 13,000 TPS holders in North Carolina, many of whom have American-citizen children, own homes, and have become deeply integrated into the social fabric of our state. Ending TPS could cost North Carolina’s economy over $570 million annually, break up families, and undermine communities across the state. Sadly, this kind of invective is nothing new from a President who stokes racial hatred like it’s his favorite party game. It’s particularly easy in this case to see how the President’s uncharitable attitudes translate into policy decisions that hurt people that don’t fit his definition of what makes America great. It was only a few days ago that the Trump Administration decided to end TPS for people from El Salvador, thereby putting thousands of lives at risk and ignoring Salvadorans’ many contributions to our nation and our economy. If you are fed up with shameful attacks on immigrants and their families, please respond to this action alert and tell our leaders in Washington DC to enact rational and humane immigration policy. Ever since the Trump administration decided to end DACA (Deferred Action for Childhood Arrivals) in September, tens of thousands of North Carolinians’ lives have been plunged into turmoil. It is now up to Congress to pass a viable long-term solution, or risk tearing families apart, undermining our economy, and throwing a wrench into public finances. The simplest solution is to pass the Dream Act, legislation that would codify the basic deal that DACA offers to undocumented immigrants brought here as children who commit to furthering their education and staying out of trouble with the law. 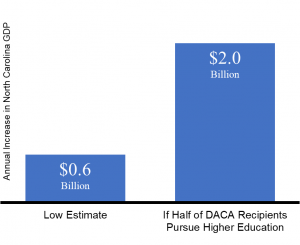 In addition to the stability and opportunity each “DACAmented” individual would obtain through a legislative fix, analysis by the Center for American Progress estimates that passing the Dream Act would increase North Carolina’s long-term economic output by at least $550 million per year, an impact that could grow to almost $2 billion annually if at least half of the people eligible for DACA pursue higher education.